Vaporizing cannabis has gained in popularity over the last several years, just as e-cigarettes have. Scientists from Johns Hopkins University have proved that inhaling vaporized marijuana will get you way higher than smoking the exact same amount of weed. This new research adds to this knowledge by determining that the psychoactive effects of vaporized marijuana are also different from smoking it. Vaporized cannabis produced greater pharmacodynamic effects and higher concentrations of THC in blood compared with equal doses of smoked cannabis, explained the researchers in the paper resulting from their study. Cannabis releases cannabinoids (the compounds that provide a high and some potential benefits) at a temperature lower than that at which it burns. The benefits of Cannabis vaporization and why is good for you? Smoking weed may be less harmful than smoking cigarettes, but smoking weed can still be pretty harmful. Vaporizing your weed is a decent option, as not only will you be able to avoid inhaling the harmful carcinogen-laden smoke, but it facilitates a precise microdose accuracy. Vaping weed, on the other hand, doesn’t involve combust marijuana in the way using a pipe or bong does because vaping is a lot cleaner than burning weed. When vaping, somewhere around 95% of the vapor you’re getting contains those sweet cannabinoids, and that means you’re getting a 95% lung irritant-free puff every time. It makes a lot of sense why healthy people should invest in vaping, especially for cancer patients who use cannabis medicinally to treat nausea during treatment. The study shows that new or infrequent cannabis consumers may be more likely to overdose it when vaping instead of smoking. 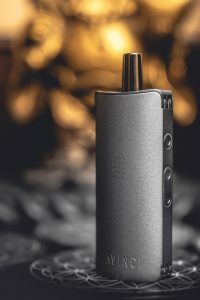 So they should probably look into getting a vaporizer that comes with micro-dosing options, like DaVinci MIQRO vaporizer, a smaller version of the popular DaVinci IQ, without any decrease in performance. In the world of cannabis, there is often the sentiment that more is better. But that mindset doesn’t work for all of the ever-expanding population of cannabis consumers. The technique has become an increasingly popular way to reap the benefits of cannabis without getting high. Rather than concentrating on, or even aiming for, a high, microdosing allows cannabis consumers to explore the subtler aspects of the plant, such as terpene profiles. Microdosing can control the unwanted side effects of taking too much cannabis. A microdose is between 2.5 mg and 5 mg—about one pull on a vaporizer. Some researchers theorize that microdosing serves to strengthen the body’s endocannabinoid function, whereas taking larger doses can make our endocannabinoid receptors less responsive. Microdosing started as a common term for people who took minimal amounts of LSD or psilocybin mushrooms as a way to treat their anxiety, depression and stress or for other benefits like creativity and focus-enhancement. Micro-dosing is the new trend of using marijuana more for the benefits than the side effects. Microdosing is particularly helpful for anyone who does not want to feel high or who is prone to anxiety or paranoia. It’s not just your mood that microdosing cannabis could improve: another study in mice has found that frequent, low doses of THC (the main psychoactive molecule in cannabis) can reverse ageing-related memory loss. Technology has changed the way we get high. When you take a ‘hit’ from a vaporizer, there is no smoke to breathe, only water vapor and the essential ingredients of the herbs you are smoking. The fact is, vaporizers work by heating marijuana to a temperature that is hot enough to evaporate the active ingredients, but cool enough to avoid combustion. DaVinci developed many advanced vaping technologies for their devices such as “smart paths” digital display, fully ceramic conduction bowl and zirconium vapor path. The flavor of your cannabis comes through perfectly because of the zirconium heating chamber. The DaVinci vaporizers offers a complete temp spectrum ranging from 0°C to 221°C and will hit your desired temp in about 45 seconds on average. What really makes these vaporizers stand out is their Smart Path Technology, which will let you select from four different temperature settings. That experience is obvious when we look at both DaVinci IQ and MIQRO, which are much more innovative than other vaporizers available on the market. These vaporizers not only looks great, but the high-quality materials and high function ability makes it arguably one of the best we have ever seen. Returning to the consumption of cannabis, it is evident that the use of the vaporizer brings a series of advantages and improvements to the health of the user, compared to the traditional use of cannabis by smoking. When it comes to vaporizers, it’s all about preference and what works best for each individual, but both Davinci IQ and MIQRO are amazing. The vapour quality of the IQ is exceptional, smooth and very cool. Activation of THC leads to the best medium euphoric experience and enlightened consciousness. It’s simply one of the most intelligent vaporizers you would ever come across and is perfect for those who want a hybrid conduction/convection style vape for herb.